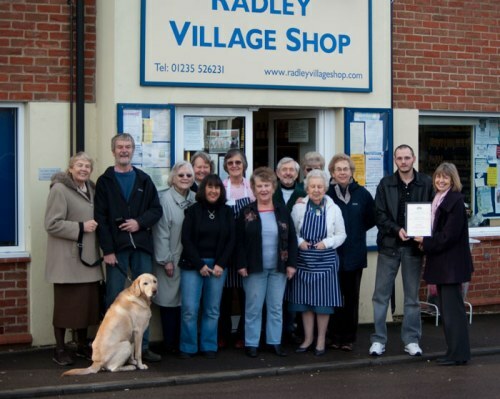 Radley Village Shop has won third place in the Community-owned category of the Oxfordshire Village Shop of the Year 2009 competition organised by Oxfordshire Rural Community Council . The certificate and prize of £50 were presented on 5th February 2010 to the shop manager, John Goodenough, by the ORCC Village Shops Development Worker, Jane Barker. Volunteers (and dog) gathered outside the shop on 5th February to witness the presentation of the award by Jane Barker (extreme right) to shop manager, John Goodenough (second from right). Radley Village Shop opened in May 2007 and is a community co-operative run by volunteers and a paid manager. Its aim is to offer a range of basic essentials but with an emphasis on higher quality and local produce wherever possible. See the shop’s website for details of opening times, etc.